Gov. 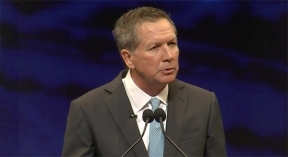 John Kasich shares details of a recent donation to Ohio in support of drug-abuse prevention efforts for youth in Appalachia. Joining the governor are Cara Dingus Brook, President & CEO of the Foundation for Appalachian Ohio; Dr. Mark Hurst, Director of the Ohio Department of Mental Health & Addiction Services; Cynthia Dungey, Director of the Ohio Department of Job and Family Services; and Bridget Harrison, Deputy Director of Legislative Affairs for the governor's office.